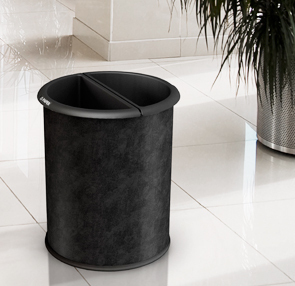 This black vinyl, dual-sided recycler is ideal for stylish hotel rooms, guest rooms or break rooms, and it fits perfectly under the desk in the office. The polypropylene liners are leak-proof, fully removable, and can hold up to 3.2 gallons. One liner can hold up to six uncrushed water bottles. Implementing the InnRoom Recycler at your facility is an easy way to encourage your guests or employees to sort recycling items and save time for maintenance crews, all while maintaining the aesthetic of the environment. Includes two easy pull-out liners and a set of decals to personalize each basket lip. Decal set includes: Trash, Aluminum, Paper, Glass, Plastic, Mixed organic, and Recycle. Extended Lip for Decal Application and Easy Emptying. Formed Mild Steel with Durable Vinyl Wrap. 15% Post Consumer Recycled Content Recycling Bin. Shipped in a Carton Made with Recycled Content.